Facebook has passed a “substantial milestone” toward gaining industry accreditation for its “viewability pipeline measurement process,” ad industry ratings authority, The Media Rating Council (MRC), announced Monday afternoon. The MRC said it has completed its assessment of the component of the process controlled by Facebook, and that its audit committee has concluded that Facebook was “materially compliant” with the MRC’s Minimum Standards for Media Research, as well as other applicable industry measurement guidelines. 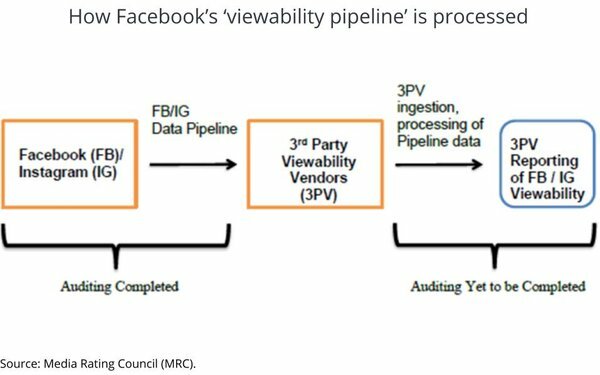 The MRC said final accreditation of the Facebook pipeline data ultimately will depend on the successful completion of the council’s audit process related to the “ingestion, processing and reporting” of the Facebook pipeline by third-party viewability vendors, including Moat, Integral Ad Science and DoubleVerify, all of which have agreed to have their processes audited by the MRC. The MRC said the pipeline data consists of “discrete data points related to the delivery of ads that are directly collected by Facebook and supplied to third-party viewability measurement vendors that partner with Facebook/Instagram. The MRC said the audit of each of those third-party vendors currently is in “various stages,” but did not disclose when a final decision will be made.